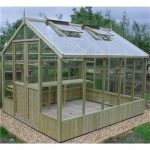 This is a fantastic all-round greenhouse which won the prestigious New Products Award at the Glee Exhibition NEC Birmingham in 2010. You can’t go wrong with the high quality design. When you buy this it comes with all vents, auto vent openers, dam barrier and the glass is toughened. 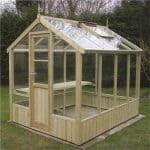 Constructed using premium quality wood which is already pre-treated you will be thrilled with your purchase and it comes ready-made so there is no self-assembly. You will spend hours inside and it will last for many, many years. Wonderful! 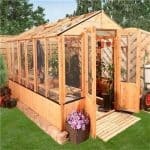 Greenhouses have always been a hobby of mine. They seem to calm me down when I am stressed. It’s always nice to have that one hobby you can go to when you have nothing else to do, or when you just need to get out of the house and find something productive to do. I am glad I found this greenhouse. It is small, yes, but it is only me using it and I love it. I wanted something small. The price had me pleasantly surprised. I couldn’t believe the price! The security also had me amazed. I am just blown away by all that I got out of this beautiful greenhouse! 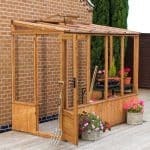 This greenhouse has been terrific for my flowers and plants. It is small, but big enough for me. The price was within the range I was hoping. I was looking all over prior and couldn’t find anything that wasn’t twice the amount I paid for this one. The area was big enough for the few big plants I have, as well as some flowers I got as well. The toughened glass stood out to me. I love the light color of the greenhouse. 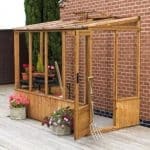 Lovely looking unit (I got greehouse/shed combi), assembly included in price by 2 efficient, pleasant guys. Quality is superb, even better than I expected. Although upper end on price, for what you get it’s actually great value in my opinion. Chuffed to bits!